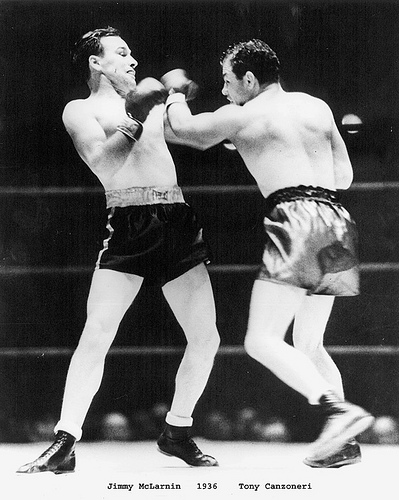 Tony Canzoneri vs Jimmy McLarnin. Two of the very best from one of boxing’s great eras, the 1930’s, the Depression years, the glorious decade of Kid Chocolate, Barney Ross, Henry Armstrong and Joe Louis. 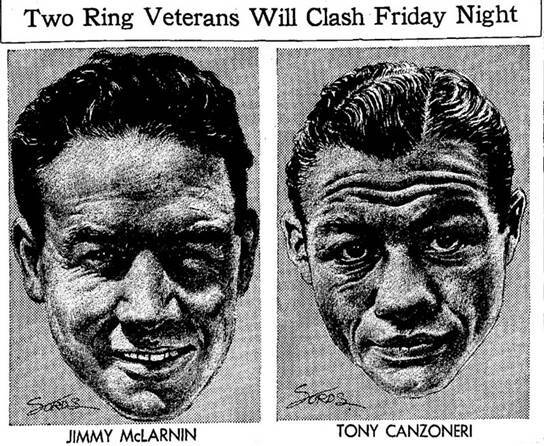 Only a year separated McLarnin and “Canzi” in age and by 1936 they were both grizzled, though still-formidable, veterans. 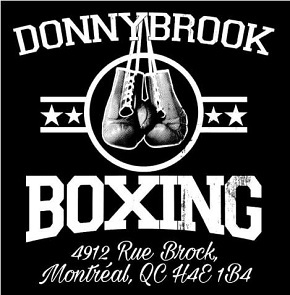 But between May of that year, when the two gave fight fans a thrilling ten round battle, and the following October when they locked up a second time, something happened to Canzoneri. 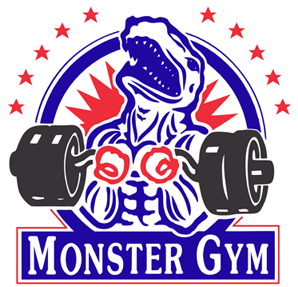 A gifted pugilist in his prime, with sharp reflexes, crafty moves and dangerous power in both fists, he suddenly didn’t have it anymore. His peak was gone for good. Just the year before Canzoneri was still a force to be reckoned with, seemingly not that far removed from the form he had when he was regarded as clearly the finest boxer in the game with big wins over Jackie “Kid” Berg, Kid Chocolate and Billy Petrolle. In 1933 he had dropped two close decisions to Barney Ross before eventually regaining the lightweight crown from Lou Ambers in May of ’35. Meanwhile McLarnin was coming off his own great series with Ross, a trilogy of close 15 round battles which saw “The Baby Faced Assassin” lose the first and third clashes, leaving McLarnin empty-handed in terms of title belts. Not in terms of money, though. 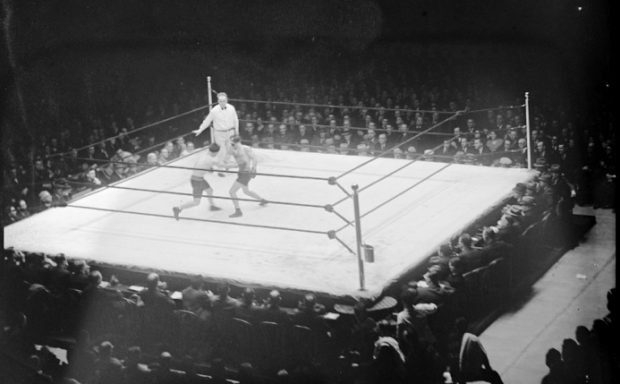 All three matches had been huge events and McLarnin looked to only add more funds to his bulging bank account as he would rumble with Canzoneri at Madison Square Garden twice in the same year, both matches scheduled for ten rounds. 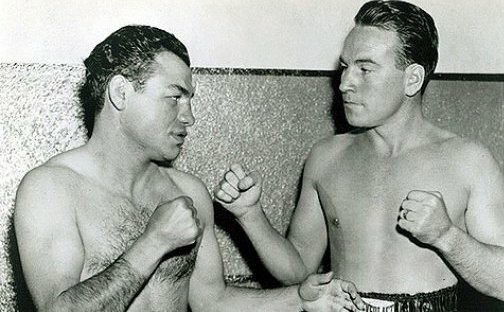 The first Canzoneri vs McLarnin match was a terrific battle that only became more dramatic as the rounds passed. On that night “The Dublin Dynamiter” was clearly out-classed as Canzoneri was just that much sharper and on his game. 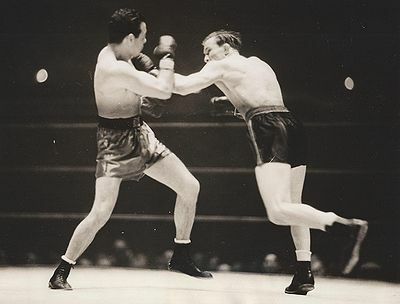 Bouncing energetically about the ring and consistently beating McLarnin to the punch, the Italian-American showed the New York fans the kind of skills which had made him one of boxing’s truly great lightweight champions. He even tried for a knockout in the last two stanzas and the judges all gave Tony the win by scores of eight rounds to two. The two veterans pose for the cameras. But Canzoneri was far from ready to pack it in. A month later, it was time for a rematch with McLarnin, but the second meeting of these two ring legends would be of a very different order from their first. 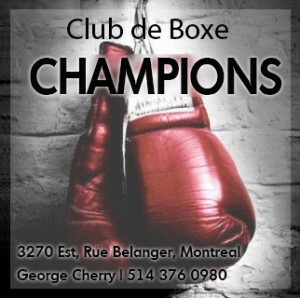 The match in May had been a thrilling shoot-out with both men looking to land big shots, but McLarnin’s aggressiveness had given Canzoneri chances to counter and land solid blows. This time McLarnin boxed conservatively behind his left jab and it proved a winning strategy. Canzoneri couldn’t get past the left hand of “The Belfast Spider” and in the later rounds he bore the wounds of war: a swollen and bleeding right eye and a split lip. He was such a gory sight that by the seventh round fans were calling for the match to be stopped, but the proud former champion survived to hear the final bell.